In our next installment of helpful tips for construction safety, we’re focusing on personal protective equipment (PPE) and the must-have items that should be present at every jobsite. 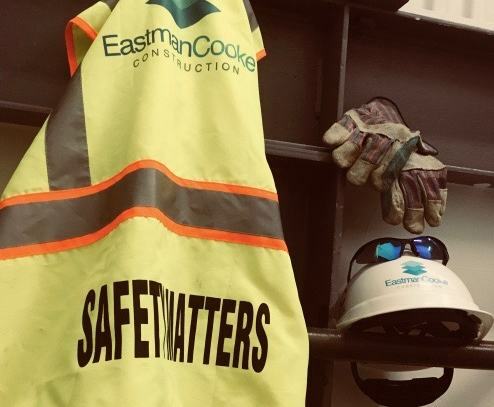 “Safety on the job is of the utmost importance,” says Paul Weiss, Eastman Cooke Assistant Project Superintendent. 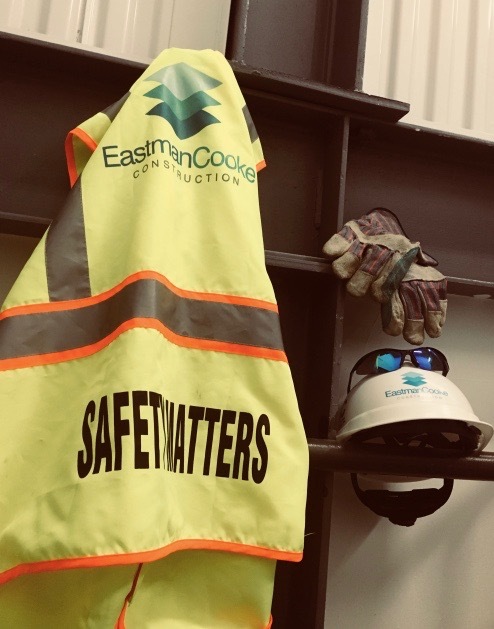 “To comply with OSHA safety regulations and recommendations, Eastman Cooke established a mandatory safety plan that is executed on every project.” In addition, all subcontractors working at Eastman Cooke jobsites are required to provide their safety plans in writing. Proper clothing, such as long pants, long-sleeved shirts, sensible footwear and a reflective vest. Since every construction project is different, Paul recommends checking with your foreman, site superintendent or site safety manager if you are unsure of any necessary requirements. Properly functioning tools are another safety requirement on jobsites. Paul advises to double check that all of the manufacturer’s safety devices are in place. In the event someone spots a defect, the tool should be labeled and removed from service. The same action should be taken for damaged extension cords, Paul points out. Larger jobs often require the use of heavy machinery, including excavating equipment, booms and man lifts. While operating the machinery, workers must wear high-visibility clothing or vests at all times. When operating a boom or man lift, or when working near shafts or at the leading edge of a building, construction crews must follow OSHA requirements for proper harness and lanyard use. For further reading on jobsite safety guidelines, visit: www.osha.gov/shpguidelines/docs/8524_OSHA_Construction_Guidelines_R4.pdf.